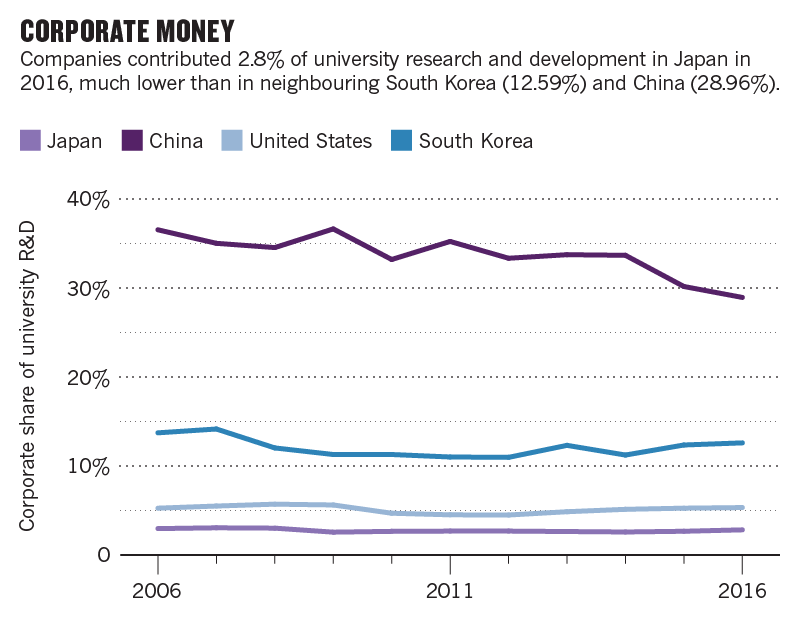 Academia and industry in Japan remain disconnected, despite efforts to bring them together. 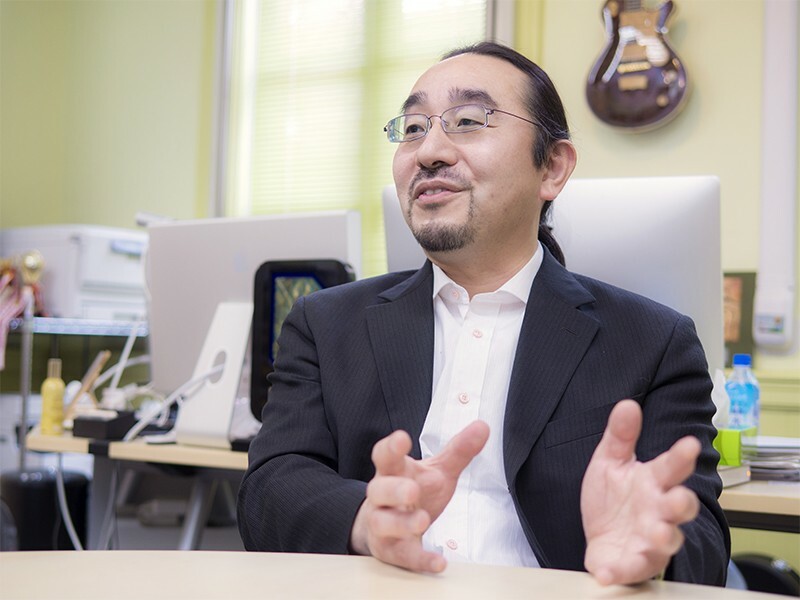 Hiroaki Suga is among the few researchers in Japan who has launched a successful start-up. The accepted wisdom is that scientists in Japan are either respected or rich; not both. Then there’s Hiroaki Suga. Suga, a chemist, heads a laboratory at The University of Tokyo (UTokyo) and is the co-founder of PeptiDream, a US$5 billion biotech company. His experience is seen as proof that professors in Japan can be successful in both academia and industry. “People have realized that you can keep doing good science while also having a large impact on society,” he says. PeptiDream is often referred to as the type of science-driven innovation that the Japanese government wants more of: fundamental research is translated into profitable products with tangible societal benefits. Research institutions in Japan are being forced to be more entrepreneurial in their search for funding, due to flat national budgets, and the growing cost of supporting an ageing population. Companies are being enlisted to support the charge. But analysts point out that, despite years of effort, blockbuster academic–industry collaborations in Japan are still far from routine. “Everyone talks about PeptiDream because it is unique,” says Suga. He believes a large part of the problem is the old-fashioned view among professors that commercialization efforts will taint the quality of their academic work. “Researchers engaged in industrial applications are less respected than those involved in basic science,” he says, though that attitude is slowly changing. Budget constraints, Suzuki adds, have also meant that professionals acting as academia–industry go-betweens are in short supply. In 2016, Prime Minister Shinzo Abe’s growth strategy set the goal of tripling, from 2014 levels, investment from corporations to research institutions by 2025. “This is an impossible target,” says Suzuki. Companies are reluctant to spend, he says, because of the same idle economy that constrains the government. Corporate investment in university research and development has grown by 21% since 2000, to 96 billion yen (US$870 million) in 2016. According to OECD statistics, this amount represented 2.8% of Japan’s total university R&D, which was lower than the corporate share of 5.3% in the United States. In the last 10 years, the number of university start-ups has plateaued, with a slight spike in 2017 to 2,093 businesses. Some 100 new ventures appeared that year, a fraction of the more than 1,000 that popped up in the US. Takafumi Yamamoto, president of Todai TLO, a technology licensing office owned by UTokyo, attributes the sluggish growth to Japan’s risk-averse culture. “We face a lack of entrepreneurship,” he says. But, he recognizes the sector’s significant progress given its late start. Science-led innovation has been central to government policies for the past two decades, culminating in Abe’s strategy for growth. Twenty years ago, Japan passed a law that gave Japanese research institutions ownership of their patents and intellectual property rights. The 1999 policy was similar to the Bayh–Dole Act enacted by the US in 1980. The Japanese government also instituted rules for establishing TLOs — private entities tasked with facilitating the commercial licensing of technologies developed at universities. And in 2001, the Hiranuma Plan — named after the former minister for economy, trade and industry, Takeo Hiranuma — set a goal of creating 1,000 university-led start-ups within three years. The plan met its numerical target, but had limited market impact. In 2004, national universities acquired the status of national university corporations, which afforded them increased autonomy and encouraged revenue generation through industry cooperation and entrepreneurship. More government support followed in 2013, with 100 billion yen committed to four large universities — Tokyo, Tohoku, Kyoto, and Osaka — to establish venture funds for investing in university start-ups. The four are among the top Japanese universities collaborating with corporations to co-author high-quality research papers in the index since 2015, with UTokyo in the lead. Several government institutions have also invested in programmes to catalyze university start-ups and university–industry collaboration. The results have been evident. A survey by the University Network for Innovation and Technology Transfer (UNITT) found that, by 2016, Japanese universities, research institutes and TLOs had hired about 1,000 specialists in tech transfer, joint research or venture support. That year alone saw more than 6,000 patent filings and close to 3,000 licensing agreements. Over the past decade, university income from royalties and selling stocks has tripled to more than US$30 million in 2016. When Yamamoto started in the tech transfer business in 1996, most faculty had no interest in filing patents, he says. Today, professors routinely prepare PowerPoint presentations about how their technology could contribute to society. The mindset of industry is also changing, says Yamamoto, towards open innovation and university collaboration. UTokyo’s royalties income for the 2018 fiscal year, which ends in March 2019, is projected to hit US$10 million — an 11% increase over the previous year. The university received US$55 million from 1,545 corporate research partnerships in 2016, and hosts around 28 start-ups in its incubator. With high demand for space, it has plans to build three new incubation facilities. Among its most successful start-ups is PeptiDream. After 14 years in the US, Suga returned to Japan in 2003 where he took up a position at UTokyo and began refining his study of an enzyme that he soon discovered had enormous business potential. The standard genetic code is designed to form proteins from a limited set of 20 amino acids. The enzyme Suga developed, known as flexizyme, is much more versatile. It can combine any type of amino acid — not just the protein-forming kinds — by reprogramming the genetic code. With access to a more expansive repertoire of building blocks, flexizyme can create amino-acid chains, or peptides, that exhibit previously unseen characteristics. In 2006, Suga teamed up with entrepreneur, Kiichi Kubota, to establish PeptiDream as a drug discovery company, and began approaching pharmaceutical companies with their patented technology. They offered the ability to screen vast numbers of circular peptides created using flexizyme for unique therapeutic properties, eventually convincing large firms such as Novartis and Bristol-Myers Squibb. PeptiDream went public in 2013, and joined the Tokyo Stock Exchange in 2015. It has established several dozen collaborations with small and large biotech companies, and has begun to develop its own peptides to market as therapeutic drugs. In 2016, Abe honoured the start-up with the Nippon Venture Award for innovative businesses that contribute to society. UTokyo has other successful start-ups to boast about. Vedanta Biosciences is a rare example of an international spin-off. The company licenses fundamental research developed by immunologist Kenya Honda while at UTokyo, in which Honda isolated specific strains of gut bacteria that induce a therapeutic immune response. After failing to attract the interest of investors in Japan, Vedanta Biosciences set up in Boston, Massachusetts, with US venture capital. In 2015, the company signed a US$241 million deal with Janssen and Johnson & Johnson Innovation to license a bacteria-based drug candidate for inflammatory bowel disease. The spinoff activity is not limited to the life sciences. In January 2018, Preferred Networks, a UTokyo start-up in AI and deep learning, announced that it would be teaming up with automation service provider FANUC and Hitachi to establish Intelligent Edge Systems. The joint venture will develop manufacturing technologies based on AI and edge computing, in which data is processed on infrastructure close to where it is generated. While UTokyo, and its subsidiary Todai TLO, have made headway in transferring technologies, the vast majority of TLOs in Japan are smaller organisations that function independently from universities. “They are just surviving and not making much profit,” says Suzuki. In a 2014 survey of 264 Japanese companies, Koichi Sumikura, an innovation policy analyst at the research institute GRIPS, found significant discrepancies in their views of domestic versus international academic collaborators. These companies tended to hold Japanese universities in lower regard than foreign institutions, especially when looking at the pace of research and its commercial practicality. The companies felt that Japanese TLOs were unable to provide the administrative infrastructure and services needed to support collaborations with academia. They also feared that trade secrets were leaked to competitors. There is a clear discrepancy, says Sumikura, between the corporate drive to quickly turn research results into commercial applications, and the academic incentives to publish papers on basic research. The technology licensing and start-up sector has reached an impasse. The big-four university venture funds are struggling to find productive use for the 100 billion yen the government committed to them in 2013. So far, they have only managed to invest 26% of that money. In 2016, according to UNITT, only 26.5% of Japan’s research institutions and TLOs launched a start-up; the comparable number in the US that year was 79.6%. Only 3.9% of university technologies in Japan are licensed to start-ups, compared to 17.1% of licenses in the US. A recent rule change, spurred by the success of PeptiDream, could give the academic spinoff sector a spark. Last year, the government decided that certain public universities can retain their shares in start-ups over the long term. This could encourage those universities to license their technologies to start-ups, which can’t afford to pay in cash, but can offer stock options, says Suga. Yamamoto’s dreams remain large. “We need examples like Google or Cisco Systems that, not just Japan, but the world is talking about,” he says. This article is part of Nature Index 2019 Japan, an editorially independent supplement. Advertisers have no influence over the content.